Country Western - Southern Jumbo (SJN) Guitars | Fretted Americana Inc.
A Near Mint 1958 Country Western "A Relabeled and Cosmetically Altered Southern Jumbo"
This superb "Country Western" flat top weighs just 4.20 lbs. 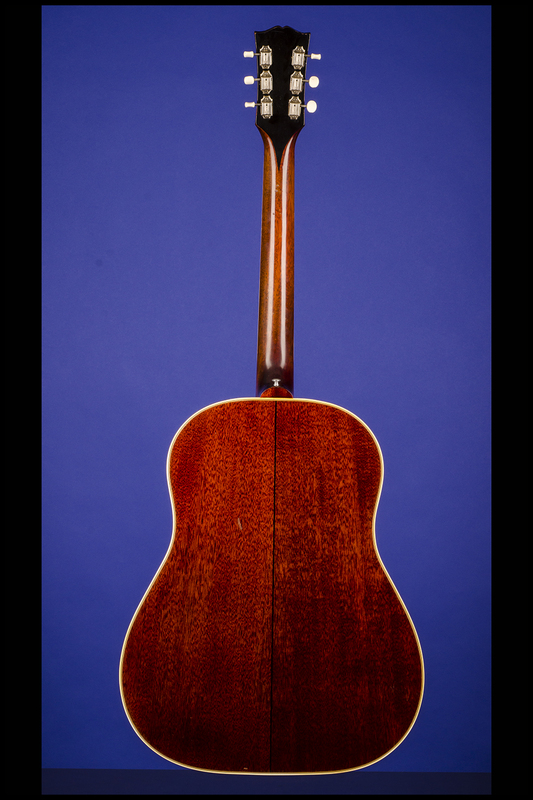 It features a 16 1/4 inch wide and 4 7/8 inches deep body with a selected natural finish two-piece x-braced spruce top with a four inch diameter, multi-bound sound-hole, two-piece red mahogany back with a center black strip and matching rims. 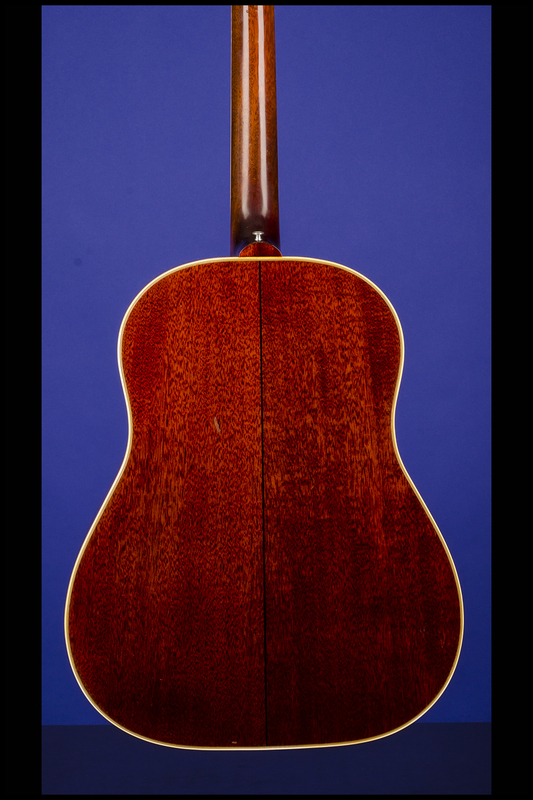 One-piece red mahogany neck with a nice, fat nut width of 1 11/16 inches, a scale length of 24 3/4 inches and a wonderful thick profile. Single-bound, Brazilian rosewood fretboard with 20 original thin frets, inlaid split-parallelogram pearloid position markers and black dot side markers. The top has seven-ply black and white binding, the back has five-ply white and black binding, and the soundhole rings are in two groups of seven white and black and three white and black. 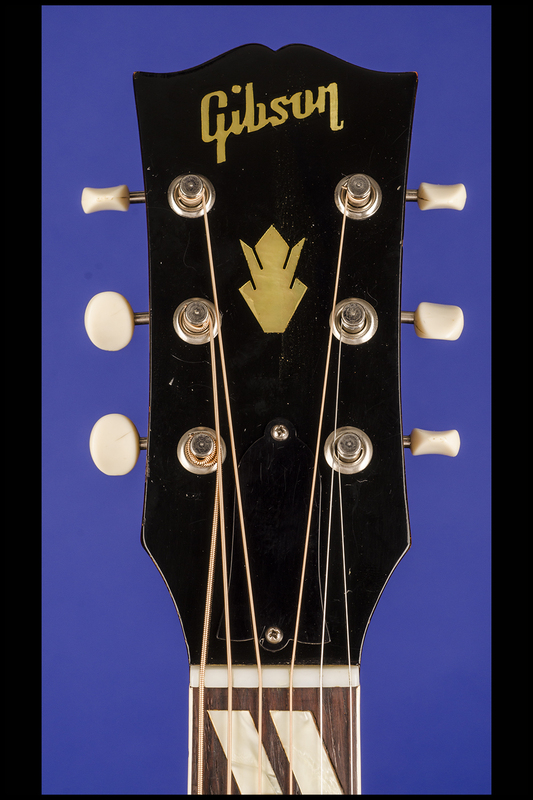 Black faced headstock with inlaid pearl "Gibson" logo and pearl double-crown inlay, back of headstock with black 'Widows Peak'. Single-ply black plastic truss-rod cover secured by two screws. 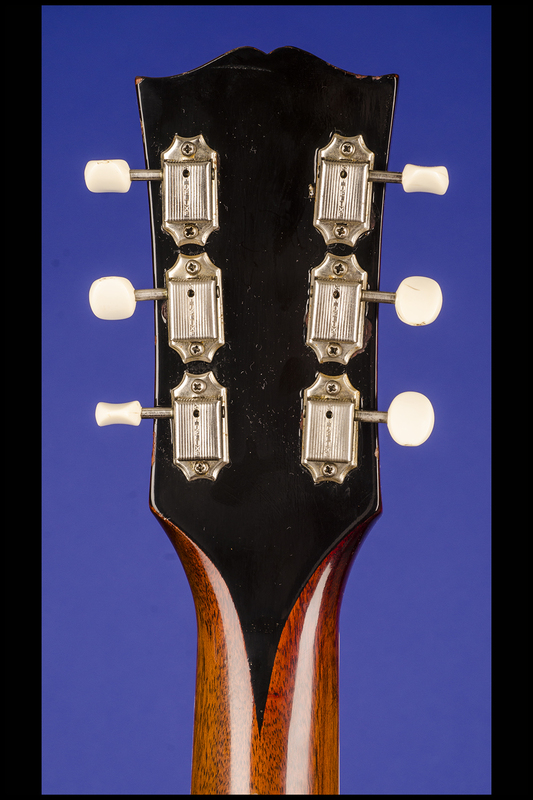 Individual single-line Kluson Deluxe tuners with oval metal buttons, each with "D-169400/Patent No" stamped on the underside. Brown celluloid (tortoiseshell) 'pointed-style' pickguard. Bone 'bar' bridge on rosewood 'top-belly' bridge with two circular pearl inserts and six white plastic pins. Inside the sound hole is the original beige oval "Gibson Country Western Model" label surrounded by a 'rope' design in brown. The serial number "T 7276-32" is stamped in black on the neck block. 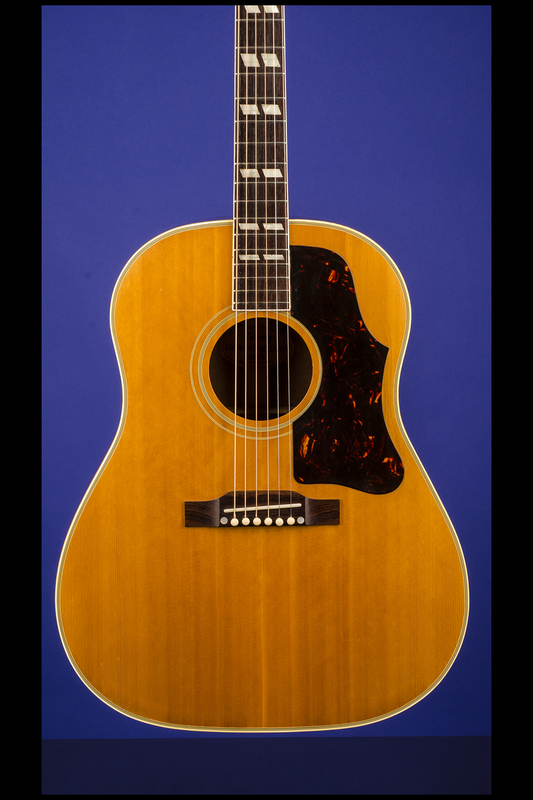 This fifty-nine year-old beauty is very comfortable to play and is one of the best sounding Country Western's that we have seen. The first four frets show very slight wear and there are a few very small marks from a capo on the back of the neck behind the first five frets. There are a few very small marks and some very minor belt-buckle rash on the back and sides, otherwise this guitar is in near mint (9.25) condition. 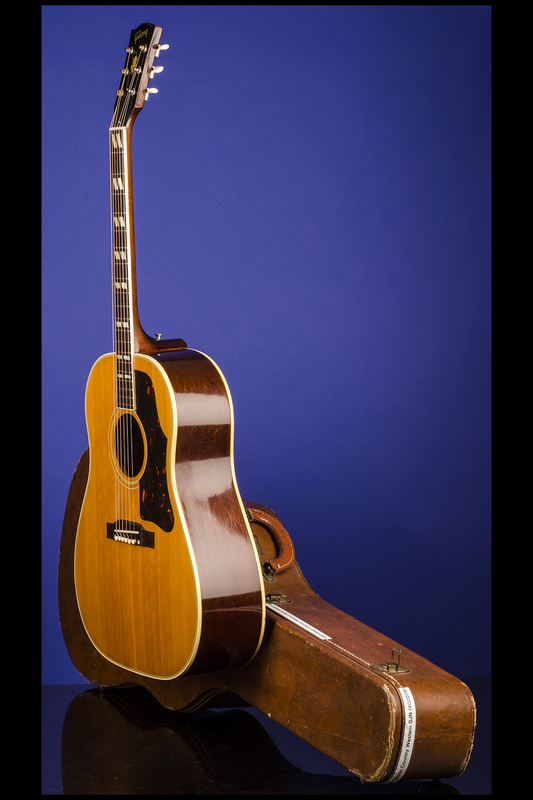 Also included is the original "Country Western Jumbo" tri-fold hang tag, the original black leather guitar strap, two original March 1958 & March 1959, sixteen-page illustrated Gibson catalogs, both featuring the SJN, and an original box of Gibson Mona-Steel Strings (with four wound G or 3rd Sonomatic strings. 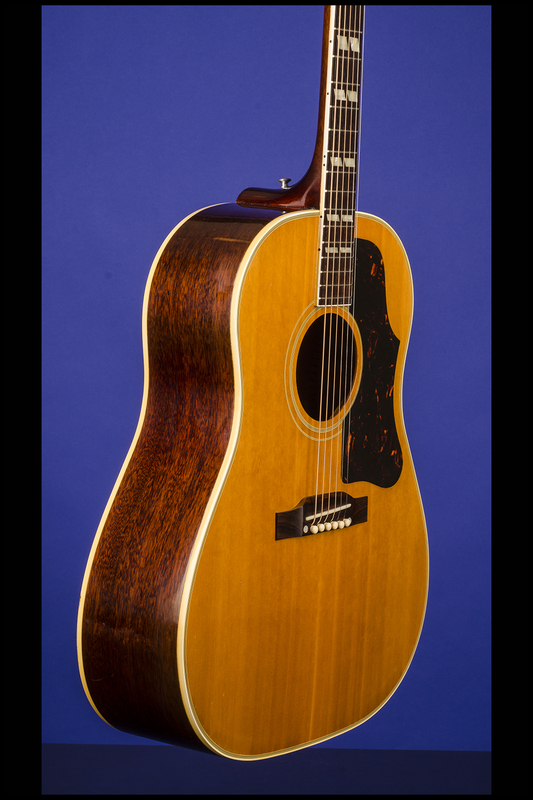 Housed in the original Gibson 'Faultless' four-latch, shaped brown hardshell case with green padded flannel lining (8.75). According to the Gibson shipping records just 15 SJNs were shipped in 1954, 498 in 1955 and 488 in 1960. There are no figures available for the years 1956 through 1959 but the consensus is that very few SJNs were made during those years. "During the Korean War [1950-1953], no model was introduced and no model deleted, for the United States was in a major recession that lasted most of the 1950s. 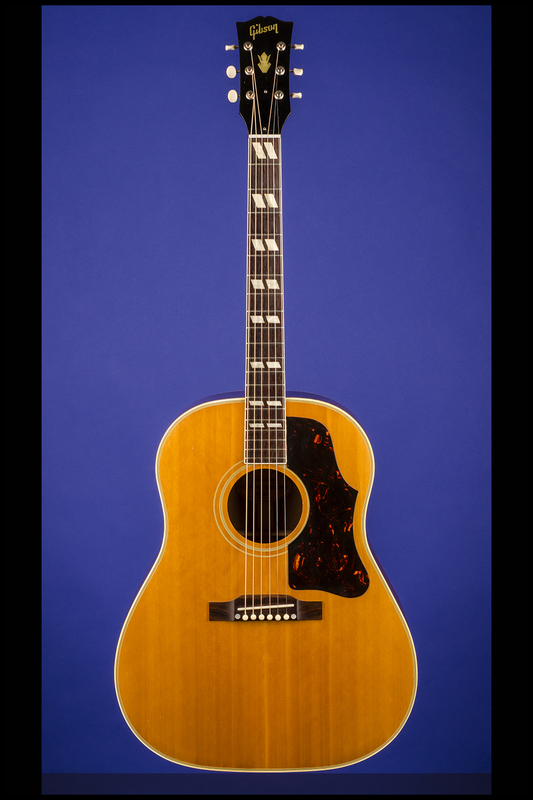 Only two acoustic models appeared in the period from 1952-1959. In 1955 the Country-Western came out, but it was not so much a new model as a relabeled and cosmetically altered Southern Jumbo… By 1949, the Southern Jumbo had the new block script logo, in gold, on the peghead. Its bridge had also taken on the top-belly design. In the early '50s the peghead that in lateral view tapered slightly from top to bottom became a uniform thickness. Apparently no other significant changes appeared until the mid-1950s. 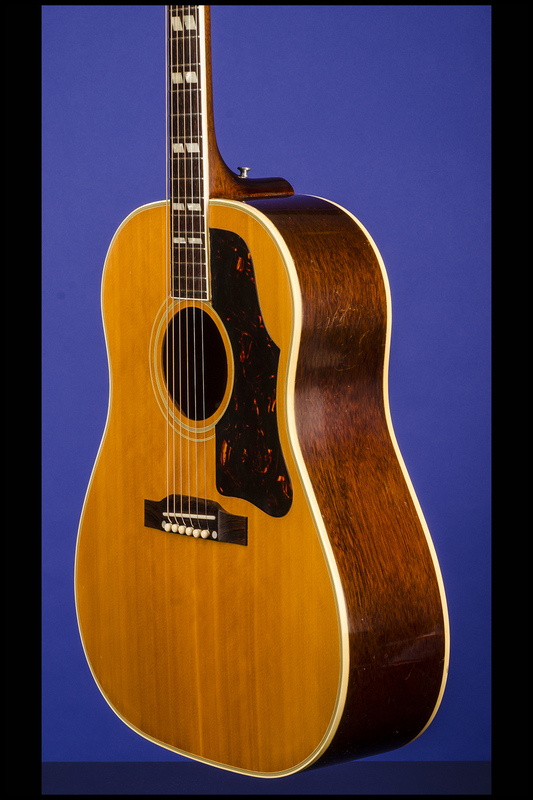 All SJs featured sunburst finishes until 1954, when a natural spruce top was offered. In about 1956, this natural Southern Jumbo was named the SJN as an option to the standard Southerner Jumbo. Also at this time the teardrop pickguard was dropped in favor of the longer style used on the J-185. In about 1955, the 19-fret fingerboard was changed to a 20-fret version. 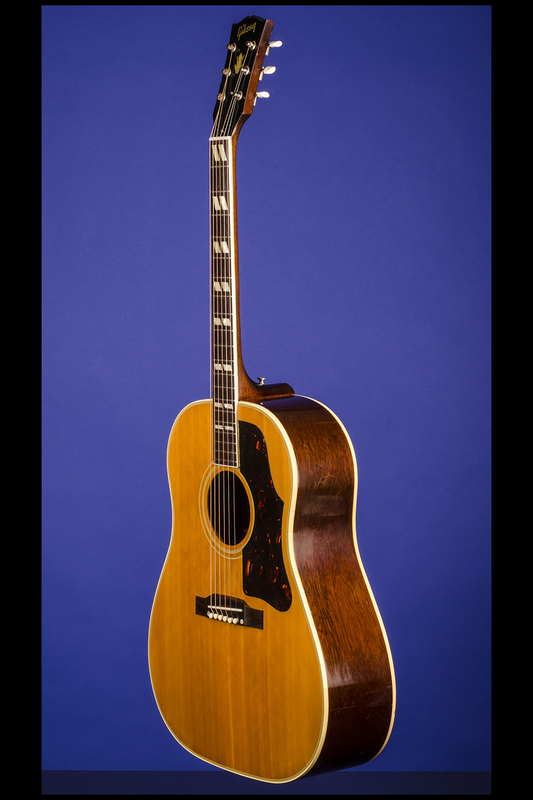 In this same general time period Gibson dropped the top-bracing system that had been used since the introduction of this model, switching to the lower, non-scalloped bracing construction that became standard on most Gibson flat-tops of the mid-'50s. 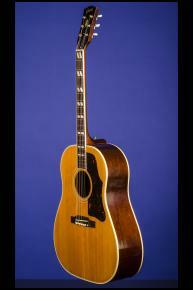 By 1956 or so the gold silkscreened "Gibson" was replaced by pearl, and the pearl "crown" logo was inlaid below it. Before the original round-shoulder Southern Jumbo evolved into the square-shoulder shape, a couple of changes occurred. 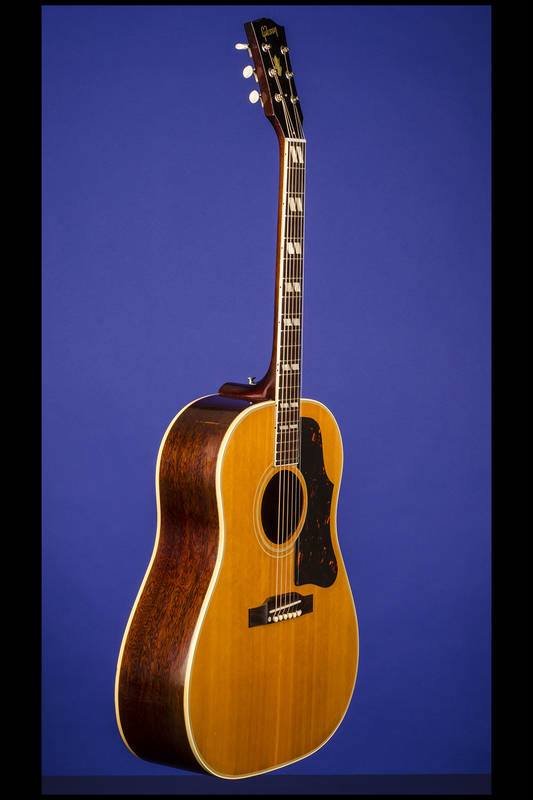 For example, in 1962 the natural-finish guitars were renamed, to the "SJN Country-Western." Appropriately enough, these latter guitars feature a rope edge around their beige ovoid label. Additionally, there are some late-1961 cherry sunburst Country-Westerns, but how rare these are is unclear." (Eldon Whitford, David Vinopal, & Dan Erlewine. Gibson's Fabulous Flat-Top Guitars. An Illustrated History & Guide, pp. 6 & 65-66).